Teardrop Trailers are mini caravans, which became popular in the US in the 1930s. Their popularity has never waned but recently they have crossed into mainstream popularity thanks to the glamping phenomenon and modstalgia. 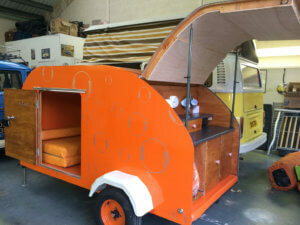 We became custodians of The Nodpod when we bought Lola, our orange 1972 VW T2. ” Don’t ask me to sell them separately” said Paul, whom I’d recently become acquainted with through his ebay advert for Lola. “I wouldn’t dream of spliting them up”, replied I. My reasons were: I believe VW T2 heritage should be maintained wherever possible, I would no more split the vehicles up than change their names, asthetically they looked amazing together and I loved the practicality of having a seperate vehicle towed behind your VW Camper, creating two unique living areas, bedrooms and kitchens. We have recently rebuilt our Teardrop Trailer A.K.A The Nodpod, by using our old one as a template. It had become necessary as the wood was rotting and we wanted an improved and watertight version. Luckily we had a very talented carpenter on hand, Steven Clark. Stevie hadn’t build a teardrop before but he had built campervan interiors. 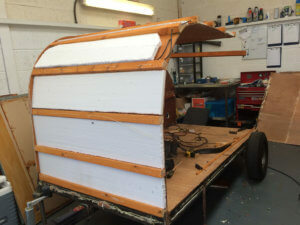 His skills and up for it can do attitude, merged well with those of Mr Vintage VW Campers and together over several days and nights they took the old trailer apart and used it as a template to build the new one in marine ply timber. Stevie introduced us to dibond, a composite material used in sign-making and also the talented Paul Connelly of Connelly Design, who after the marine ply had been wrapped in dibond, was able to vinyl wrap the ‘Pod. This along with the hurricane hinge sourced from a US Teardrop firm make the Nodpod as watertight as we hoped. We have a fantastic pair in Lola and the Nodpod, they are perfect for a family or group of friends holiday, for those who don’t want to spend the entire holiday in each others pockets. We have also found The Nodpod is popular with couples who want extra storage space, when going away in Lola. If Lola is booked without the Nodpod, then you can hire the Nodpod to tow behind your own vehicle, if you have a tow bar with single electrics and a seven pin point. 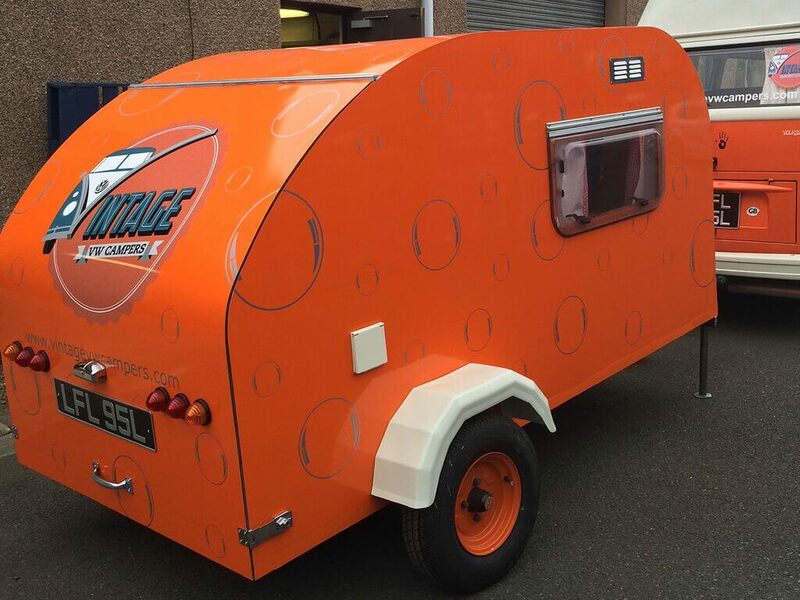 The Nodpod is great for events and festivals, the kitchen area can be used as a bar, with the living/sleeping area providing great storage potential.